It’s almost become a game to see if I can find it when I enter a friend’s kitchen for the first time, Where’s Waldo?-style. Is it stacked on a shelf, peeking out from inside a cabinet, maybe topped by a box filled with old family recipe cards? Is it dog-eared, faded, and splattered with sauce? A copy of the Moosewood Cookbook by Mollie Katzen is almost as ubiquitous as Mastering the Art of French Cooking for multiple generations of cooks—doing for the second wave of American vegetarian cuisine what Julia Child did for boeuf bourguignon. Odes to the original 1977 cookbook could fill a book themselves, so much so that a 40th anniversary edition of the OG version is coming out this fall. No offense to the revised, healthy-ized 2000 edition, but it’s this charming paperback that everyone holds onto for dear life, no matter how tattered it gets. My copy used to belong to my stepmom before she passed it on to my sister, who then relinquished it to me. The binding is splitting like an old textbook, pages falling out anytime I open it wide to flip through. And yet I’ve never made a recipe from the Moosewood Cookbook and followed it exactly to the letter, and I think that’s part of the book’s enduring beauty. The handwritten recipes and Katzen’s disarmingly casual voice make everyone who attempts one of its recipes feel pretty ok about whatever happens next, whether or not they have tree ears and freshly ground anise for the szechuan tofu or are substituting regular old button mushrooms instead and making do without a pinch of spice. Even now, when I’m stuck in that “what am I gonna make? 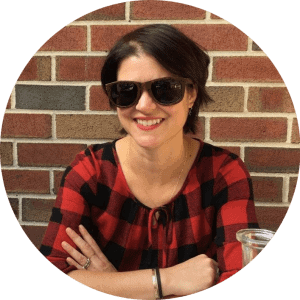 ?” spiral, I pull the Moosewood Cookbook off the shelf and rifle through the pages, looking for an ingredient or preparation that will spark an idea or let me go off on a cooking tangent. That’s what happened with this sandwich. Called “The Sandwich for Bleu Cheese Fans” in the book, it’s a big old open-face California-ish pile of raw and sautéed veggies ladled with blue cheese dressing, all on hearty rye bread. My version’s not vegetarian (not when there’s leftover bacon in the fridge, no way!) 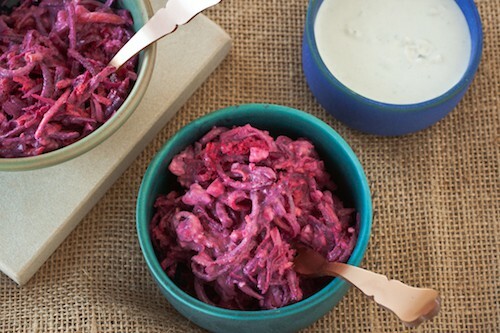 and gets its California style from avocados instead of Moosewood’s suggested vegetables, but keeps the heart of the sandwich—a delicately shredded mixture of beet and carrot, as well as creamy, pungent blue cheese dressing—in the form of a crunchy slaw. 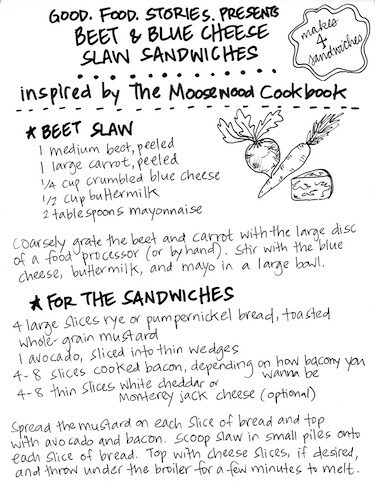 As a tip of the hat to the original Moosewood Cookbook design, here’s a handwritten guide to how I built my sandwiches. Those of you who like to print, copy, and save will find a more web-traditional recipe below… but you do you. Coarsely grate the beet and carrot with the large disc of a food processor (or by hand). Stir the grated vegetables with the blue cheese, buttermilk, and mayo in a large bowl. Spread the mustard on each slice of bread and top with avocado and bacon. 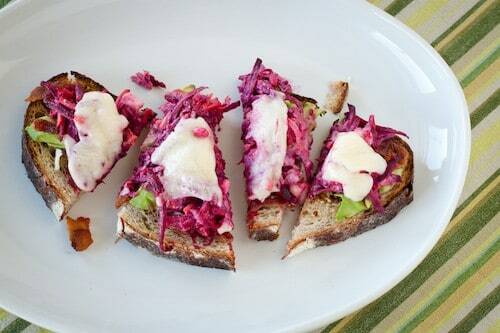 Scoop slaw in small piles onto each slice of bread. Top with cheese slices, if desired, and throw under the broiler for a few minutes to melt.